Can be made for a snack or light lunch or dinner. Selection of your favourite vegetables, sliced: carrot, celery, cucumber, capsicum,zucchini, sprouts etc. 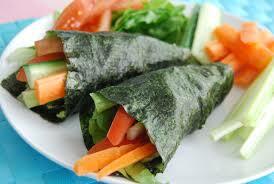 Alternatively pre-cut nori sheets into 3rds, fill with ingredients and wrap on an angel to create a cone. This style makes it easier for little hands to eat. Variations: Add your favorite condiments for extra flavor; tamari sauce, herbs or chlli.